In Noblemen, you are members of the British aristocracy. You will try to achieve influence and prestige for your family. You will grow your family's estate, earn the queen's favor, bear witness to scandalous behavior, gain influence with the church, bribe royalty, and leverage your political weight during masquerade balls; all in an effort to ensure your family's rightful place in history. After three decades, the player with the most victory points will be held in high esteem by the Queen and declared winner. 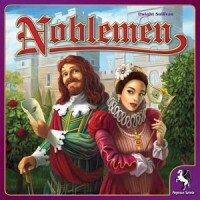 Add a Review for "Noblemen"